Hitler proposed to Amann that he should give up his job and become full-time Party business manager. 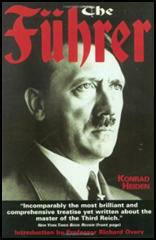 According to Hitler Amann at first thought to reject the offer. He had secure career prospects and a pension to look forward to at the bank, while employment by the little Nazi Party would mean a substantial cut in salary and an uncertain future. Hitler exercised his powers of persuasion on him for two hours. "What good will your pension be if someday the Bolsheviks string you up from a lamppost?" Amann pondered for three days and then finally accepted the job. Berchtold was not only S.S. leader, but also an editor of the Völkischer Beobachter, letting himself be bullied into the most humiliating services by the efficient and violent Amann. Consequently, Berchtold had to instruct his troop "to recruit readers and advertisers for the Völkischer Beobachter". Finally, faced with the choice of leading the Black elite or earning his modest living on the party paper, he preferred to earn a living. The S.S. was then led for a time by a certain Erhard Heiden, a stool pigeon of the worst sort. Not until 1929 did Hitler find the right man, an old friend of Rohm's and later collaborator with Gregor Strasser; an eccentric who made his living from a poultry farm in the village of Waldtrudering near Munich. He had studied to be an agronomist, but in his free time concerned himself with genealogy. This man was Heinrich Himmler. 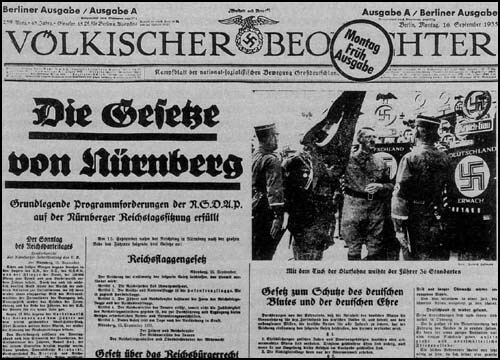 Two years after the Volkischer Beobachter had been bought for him, Hitler made it into a daily. This required money. Some of it was provided by Frau Gertrud von Seidlitz, a Baltic lady who had shares in Finnish paper mills, while Putzi Hanfstaengel, a son of the rich Munich family of art publishers, advanced a loan of a thousand dollars. Hanfstaengel, who had been educated at Harvard, not only took Hitler into his own home - where he delighted him by his piano-playing, especially of Wagner - but introduced him to a number of other well-to-do Munich families, including the Bruckmanns, another firm of Munich publishers. Like the Bechsteins, the Bruckmanns were charmed and made into friends for life. But Hitler could be highly disconcerting in company. Ill at ease on any formal social occasion, he cleverly exploited his own awkwardness. He deliberately behaved in an exaggerated and eccentric fashion, arriving late and leaving unexpectedly, either sitting in ostentatious silence or forcing everyone to listen to him by shouting and making a speech.